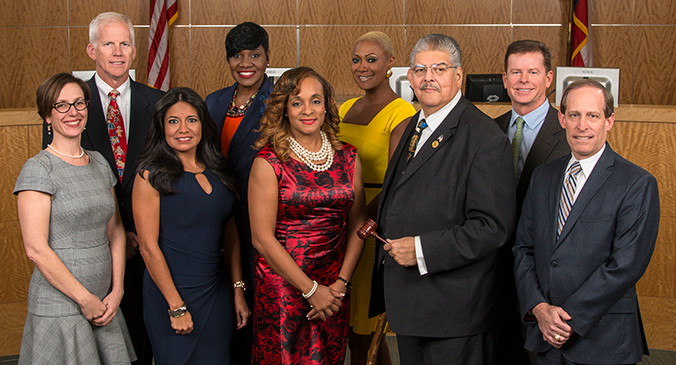 January is School Board Recognition Month, and the Houston Independent School District is joining other districts across the state to honor local leaders for their dedication and willingness to serve as advocates for public schools. These dedicated public servants become school board trustees to serve as advocates for schoolchildren because they are committed to improving public education and their communities. They devote many hours to making sure the children receive a high-quality education that will make them lifelong learners and prepare them for success. They make sure America’s school districts provide students with schools that are safe and have the resources and instructional programs they need to educate children to their fullest potential. The nine members of HISD’s Board of Education serve staggered four-year terms—and, unlike their peers in other cities, they serve without pay. They are elected from separate geographic districts, but as board members they work closely with the superintendent of schools to improve teaching and learning throughout the entire city, not just in their individual trustee districts. Anne Sung will be sworn in at 12:30 p.m. on Jan. 12 as trustee for District VII. Sung will fill the unexpired term of outgoing District VII Trustee Harvin Moore, which runs through 2017. On Monday, Jan. 9, trustees unanimously appointed Holly Maria Flynn Vilaseca (Ocampo) to serve the unexpired District VI seat, formerly held by Greg Meyers. Flynn Vilaseca also will take the oath of office on Thursday. This entry was posted in Achievement/Recognition, Board of Education on January 3, 2017 by HISD Communications.